Debby Rice tells me that Congregation Ahavath Sholom has the coming year planned for you. The entire community is invited to the 2015-2016 Film Series, which begins Oct. 11 and ends Aug. 21. Nine films will be shown on Sundays starting at 6:30 p.m. in the Zale Auditorium after the evening minyan. The films have been carefully chosen to interest everyone. Moderators will lead the discussions after specifically chosen films. A special “thank you” to the Jewish Federation of Fort Worth and Tarrant County for supporting the CAS 2015-2016 SHOWTIMES Film Series. On Oct. 11, Deli Man, a documentary about Ziggy Gruber, the owner of Kenny and Ziggy’s in Houston, will kick off the series. The story of the American deli is the story of Jews — their immigration, migration, upward mobility, and western assimilation. Of course the story isn’t Ziggy’s alone. It’s the history, anecdotes and humor that once made one’s local delicatessen the virtual epicenter not only of food, but of family, laughter and community. This documentary will make you yearn for a foot-high corned beef sandwich with a large juicy pickle on the side. Herb And Dorothy is the second film in our series will be shown Sunday, Nov. 15. He was a postal clerk. She was a librarian. With their modest means, the couple managed to build one of the most important contemporary art collections in history. Meet Herb and Dorothy Vogel, whose shared passion and discipline have defied stereotypes and redefined what it means to be an art collector. The third film, Deterrence, will screen Sunday, Jan. 10. Deterrence begins after the death of the Jewish president, whose successor is on the campaign trail to be re-elected. On a stop in Colorado, he is suddenly snowed in and he and his entourage are forced to take shelter in a small diner where the group completely takes over from the diner’s owner. Suddenly, the movie moves into a suspense film as the new president learns that Iraq has invaded Kuwait and slaughtered hundreds of American soldiers. This will be a special film that you won’t want to miss. The fourth film, Woman In Gold, to be shown Sunday, Feb. 21, is about a Jewish woman who sought to regain a world famous painting of her aunt’s plundered by the Nazis during World War II. She did so not just to regain what was rightfully hers, but also to obtain some measure of justice for the death, destruction and massive art theft perpetrated by the Nazis. This film stars Helen Mirren and Ryan Reynolds and received much acclaim. On Sunday, March 27, The Last Mentsch will be shown. This piece of historical fiction follows a man who has denied his Jewish heritage all his life. After surviving the horrors of Auschwitz, he sought to forget the trauma by creating a new identity for himself in Germany, one without Jewish friends or ties. Now faced with his own mortality, he suddenly decides he wants to be buried in a Jewish cemetery. The Last Mentsch is a powerful, emotional journey. The sixth film, Beneath The Helmet, to be shown Sunday, May 1, is a coming-of-age story which follows the journey of five Israeli high-school graduates who are drafted into the army to defend their country. At the age of 18, away from their homes, families and friends, these young individuals undergo a demanding, inspiring journey, revealing the core of who they are and who they want to be. Brought to us by the generosity of special donors, this film illustrates how these young soldiers are defending not only their homes, but also the values of peace, equality, opportunity, democracy, religious tolerance and women’s rights. On Sunday, June 19, 2016 Everything Is Illuminated, the seventh film, will roll. In this film a young Jewish American man endeavors to find the woman who saved his grandfather during World War II in a Ukrainian village that was ultimately razed by the Nazis, with the help of an eccentric local. The interpreter asks the old man, “Was there anti-Semitism in the Ukraine before the war?” Will they find the village? The past illuminates everything. This is a highly acclaimed film starring Elijah Wood written and directed by Liev Schreiber. The eighth film, A Borrowed Identity, will screen Sunday, July 17. The film features a gifted Palestinian-Israeli boy who is given the chance to go to a prestigious Jewish boarding school in Jerusalem. As he desperately tries to fit in with his Jewish schoolmates and within Israeli society, he develops a friendship with another outsider, a boy suffering from muscular dystrophy, and gradually he becomes part of the home this boy shares with his mother. After falling in love with a Jewish girl, he leaves school when their relationship is uncovered, and he discovers that he will have to sacrifice his identity in order to be accepted. Faced with a choice, he will have to make a decision that will change his life forever. This film will generate an interesting discussion after the showing. Don’t miss it. In the last film of the season, Closer To The Moon, screening Sunday, Aug. 21, a band of Romanian freedom fighters pull the crime of the century in this gripping heist film based on an incredible true story. Bucharest, 1959: with anti-Semitism on the rise, a group of Jewish WWII resistance members, led by a police inspector and an academic, reteam for an audacious act of political agitation. Posing as a movie crew, they hold up the Romanian National Bank by making it look like a film shoot. But what comes next is even more unbelievable when the group is handed down a punishment as outlandish as their crime. Game of Thrones’ Harry Lloyd co-stars in this slyly comic satire ripped from the strange-but-true pages of history. The superstar committee members of the Showtime Film Series are Liz Chesser, Hedy Collins, Lisa Laudato, Posy McMillen, Foster Owen, Arthur Pawgan, Jane Pawgan, Debby Rice, Reggie Rog, Naomi Rosenfield, Rena Seiden, Jayna Sosland, Jim Stansbury, Robin Stein, Sheila Stocker, Roz Vaden, Barbara Weinberg, Dianne Young, Stephanie Zavala, Michael Linn and Ahavath Sholom President Ebi Lavi. And an added thank you goes to Mary Frances Antweil, Lisa Laudato, Jane Pawgan, Debby Rice, Sheila Stocker and Dianne Young. They spent many hours screening the films for your enjoyment. I am always amazed at how each holiday rabbis and Jewish educators come up with new things to talk and write about and yet sometimes I want to hear something again that perhaps I have heard before. Jonah is a “reluctant prophet” — he didn’t want to do what God asked him to do. We all struggle with taking responsibility at times. Does it matter who gives you the task? Kids will say that you can’t run away from God but adults aren’t so sure. What was the challenge given to Jonah? Why did he run away? Before you try to give answers, ask more questions. Our questions help us delve deeper. Think about each part of the story: why a whale (or some say a big fish)? How did the sailors feel and why? How was Jonah sleeping during a storm? Each question leads to more thinking! In a September 2012 post on eJewishphilanthropy.com, Maya Bernstein writes these questions: Has anyone recently asked something of you that felt overwhelming and made you want to run away? What does it feel like when someone expects something of you and you aren’t sure you can do it? These questions are suggested for children but they certainly make adults think as well. Rabbi Ed Feinstein writes in eJewishphilanthropy.com in the same issue: Unlike every other prophetic book, the book of Jonah has no particular time or place. He lives in all generations, because the temptation to separate, divide, and withdraw is always present. So, each year, in the middle of Yom Kippur, at the very moment of deepest self-absorption, when the stomach groans, the head aches, and the feet are tired, we revisit the prophet in the belly of the fish to learn again that for the Jew, reaching to the soul within us and reaching to the world beyond us are the ways we reach the God who cares for us all. What does the story mean to you? Read it — really read it this year. Find the message that touches you this year as you prepare for the new year. After covering the mostly disconcerting political, diplomatic, security and domestic news about Israel and the Middle East over the past year, I’ve decided that my first column of the year 5776 will be dedicated exclusively to positive and uplifting stories about how Israel is making the world a better, safer, healthier, happier and more secure place for everyone, through technology, ingenuity, initiative…and maybe a little chutzpah. Israeli scientists recently made history when they built a bionic liver. This invention could be the solution sought by both scientists and animal-welfare activists seeking to put an end to live animal testing. Scientists at the Hebrew University of Jerusalem and the Fraunhofer Institute for Cell Therapy and Immunology in Germany have created a liver-on-chip device mimicking human physiology. They call it a 3D microreactor, or in less scientific terminology, a bionic liver. “The liver organs we created were less than a millimeter in diameter and survived for more than a month,” said Professor Yaakov Nahmias, the study’s lead author and director of Hebrew University’s Alexander Grass Center for Bioengineering. The breakthrough was due to their idea of adding nanotechnology-based optoelectronic sensors. “We realized that because we are building the organs ourselves, we are not limited to biology, and could introduce electronic and optical sensors to the tissue itself. Essentially we are building bionic organs on a chip,” said Nahmias. The sensors in the device allowed them to detect small, rapid changes in cellular respiration that nobody has ever seen before. This enabled them to identify a previously unknown mechanism of toxicity in the common pain reliever acetaminophen (Tylenol). The global market for this technology is estimated to be worth $17 billion by 2018. A new Tel Aviv University study sheds light on the precise trigger that enables melanoma cells to become invasive killers, providing a future method to block cancer by pinpointing the precise place in the process where “traveling” cancer turns lethal. It has been 34 years since the first reported case of AIDS in the U.S., and there is still no cure for the approximate 35 million people worldwide whose immune systems are infected. Given the limitations of existing drugs, an Israeli researcher at the Technion’s Faculty of Biology proposes a new strategy that will focus on the interactions between the virus’ and the host cell’s proteins, instead of solely focusing on targeting the proteins of the virus. This strategy is set to be significantly more effective in attacking the disease as the HIV-1 virus cannot survive without relying on the cellular mechanisms of the host cell. Israel entered into separate agreements with the Beverly Hills City Council and the Los Angeles County Board of Supervisors, “… for the purpose of establishing a formal relationship that fosters the exchange of research and information, facilitates joint developments, and enhances relationships and opportunities to incubate solutions to the water crisis.” Beverly Hills established a similar agreement with Israel in order to combat one of the worst droughts in California’s recorded history. Professor Hossam Haick of Israel’s Technion has developed a device that can sense disease on the breath, much like a breathalyzer test. What he calls the Sniffphone uses nanotechnology sensors to analyze the particles on the breath and is able to pinpoint exact diseases, like certain kinds of cancer, pulmonary and even the early stages of neurodegenerative diseases. It took nearly 30 years of research, but Hebrew University’s Professor David Levy developed strains of potatoes that thrive in hot, dry climates, and can be irrigated by saltwater. Potatoes are one of the top sources of nutrition in the world, but they never before grew well in hot, desert regions like the Middle East. Now farmers in these regions can grow potatoes as a cash crop. Levy said that he also intended his research to enhance understanding between Israel and its neighbors, as scientists and officials from Jordan, Egypt, Lebanon and Morocco meet with Israeli scientists to share knowledge and build bridges of information and technology. Overfishing is a serious threat to the food supply, a grave situation since fish is the main source of protein for hundreds of millions of people. But what if fish could be raised virtually anywhere, even in the desert? That is just what the Israel’s GFA (Grow Fish Anywhere) Advanced Systems has made possible. The Israeli “zero-discharge” system eliminates the environmental problems in conventional fish farming, and doesn’t depend on electricity or proximity to a body of water. Specially developed microbes purify fish waste byproducts right in the tank, with no need for spillage and refilling. The largest facility using GFA technology, in New York, produced about 100 tons of sea bream, bass and tilapia in 2010. Ten children in Tanzania have been given a new lease on life thanks to an Israeli medical delegation that flew out to the eastern African country to perform the lifesaving heart surgeries. The 20 Israeli doctors, nurses and medical technicians volunteer their time and expertise for Wolfson Medical Center’s Save a Child’s Heart (SACH) organization. The medical delegation also examined hundreds of other children with congenital heart defects. In March, a pediatric cardiology team from the Wolfson Medical Center teamed up with a Zanzibar medical team to screen 251 children’s hearts in Zanzibar and Tanzania. SACH is now working to bring some of the children to Israel for lifesaving cardiac surgery and follow-up care. The SACH charity has treated thousands of children from 45 developing nations. Next week I’ll go back to analyzing the wars in Syria, Iraq and Yemen, the atrocities of ISIS and al-Qaida, the maneuvering of Putin, Bibi’s tap-dancing to keep his coalition alive, the ongoing saga of the dangerous Iran nuke deal, the Israel-Palestine peace process and more. But for now I highly recommend that you visit the two websites listed above, where you will see, again and again, just how amazing Israel is and the contributions it makes every day for the benefit of mankind. Israel is certainly not perfect. But these days, when the darkness of extremism seems to be engulfing the region and spreading to Europe, Israel is, without a doubt, a bright and shining light to the nations. And for that we should all be very proud, and very grateful. I know I am. DALLAS — House Bill 4 — the “Pre-Kindergarten Bill” passed by the Texas Legislature in May — was the central topic of a Sept. 10 morning legislative review sponsored by the Jewish Community Relations Council of the Jewish Federation of Greater Dallas. During that meeting, Texas State Representatives Eric Johnson, D-Dallas, and Jason Villalba, R-Dallas, offered their thoughts on public education and the bipartisan workings of the 84th Texas legislative session. As many as 70 people attended the gathering on the second floor of the Aaron Family JCC in the Mankoff Center for Jewish Learning. It was part of the JCRC Legislative Series, which also included the Legislative Update and Forecast in January and the Jewish Communities Day at the State: Legislative Mission to Austin in March. In attendance were such notables as Florence Shapiro, former Texas State Senator (and JCRC adviser); Dallas County Judge Jeff Rosenfield; and the staffs of U.S. Senators John Cornyn, R-Texas, and Ted Cruz, R-Texas. It should be noted that Eric Johnson championed an alternate Pre-K bill — House Bill 1100, which would have had a full-day prekindergarten program provided by public school districts. But the legislature instead opted to pass House Bill 4, a plan favored by Texas Gov. Greg Abbott. HB4 will create a $130 million — $1,500 per child — grant program that can allocate funds to eligible school districts that agree to enhance pre-K programs focusing on students from low-income, foster, non-English-speaking and military families. Proponents describe House Bill 4 as a first step in the right direction. The criticism of that bill — which Eric Johnson reiterated to the Texas Jewish Post — is that it doesn’t go far enough. JCRC Executive Director Anita Zusman Eddy said the JCRC championed the HB4 version of the Pre-K issue, and advocated that bill in a trip to Austin last January. Melanie Rubin was the moderator during the program, and Florence Shapiro provided the welcoming remarks. Shapiro noted that JCRC has been staying on top of important issues on the local and state level. Seth Kaplan, JCRC leadership board member, also discussed the aforementioned trip to Austin as well as JCRC work done in interfaith and ethnic outreach. During a brief interview after the meeting, Jason Villalba sang the virtues of bipartisanism on bills such as HB4. “We have serious issues facing us — public education, transportation, water — and we need to work together and find consensus,” he said. 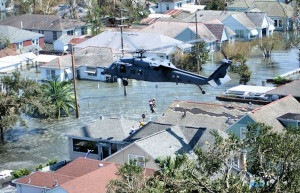 File photo: Nicole A Flotterson/US Air Force The 106th Rescue Wing lifts a stranded resident from a New Orleans rooftop. Ten years later, several survivors tell their stories. eir very survival, and uprooted a great many Jewish citizens who found their way to the Dallas-Fort Worth Metroplex to live. Several of these transplants stayed and became permanent residents of Dallas while others returned to the Gulf Coast to help rebuild. Bruce Waltzer, a retired — and noted — civil rights attorney from New Orleans, lived in Dallas with his family for about seven years before returning home. Waltzer remembers well the fury of Katrina. For a time, it seemed as if that storm had caused the death of his 4-day-old grandson, Zachery Breaux. Waltzer and his family were forced to evacuate New Orleans for fear of losing their lives. Young Zachery was left behind in the neonatal intensive-care unit of a New Orleans hospital. “When we all went, we could not take him (Zachery) with us,” Waltzer said. Family members thought they would be allowed to return to New Orleans quickly enough after the storm enough to retrieve him — which is not what happened. “The hospital became completely flooded and it became evident our young grandson was lost,” Waltzer said. Meanwhile, Waltzer, his wife Miriam, and other family members slogged though a grueling 30-hour drive from New Orleans to Houston in bumper-to-bumper traffic. They found and rented apartments in Houston. At this point, Zachery’s parents — Waltzer’s daughter and son-in-law Tad and Lani Breaux — were desperate to find their young son. They contacted the head of communications for the Jewish Federation of Greater New Orleans and asked for help. That person contacted numerous officials — even some from the United States Army — to help locate the newborn. The parents also went on national television to discuss their frantic search for their child. However, unlike many of stories of tragedy that came out of Hurricane Katrina, this one had a happy ending. It turns out Zachery had been transported out of New Orleans, placed on a plane along with adults and children and taken to Cook Children’s Medical Center in Fort Worth. Zachery was safe. And the reunion with his family was joyous. “So we had his bris in Houston, and all of our children joined us and we went to Dallas,” Waltzer said. This development was one of the sole bits of good Katrina news in the midst of such an incredible tragedy. The damage wrought by Katrina included flooding of an estimated 80 percent of New Orleans when the levees to the city broke. Those killed by Katrina are thought to have drowned. It was the 11th tropical storm, the fifth actual hurricane, and the second Category 5 hurricane of the 2005 Atlantic hurricane season. Waltzer, 83, said he and his wife, a retired appellate court judge, moved back to New Orleans a little over three years ago because the rest of their family also were doing so. But they won’t soon forget the many connections they made in Dallas. There also are the Jewish residents forced to move to Dallas in the wake of the storm a decade ago who decided to stay. Dr. Hyman Tolmas, 93, a former resident of New Orleans, said the first five or six weeks after fleeing Katrina, his wife Connie woke up every morning crying. Connie Tolmas, agreed she was in a bad place when she and her husband first moved to the Dallas area. Dr. Tolmas, who practiced medicine for over half a century before retiring, said it is unbelievable how badly the storm savaged New Orleans. Many of those who survived Katrina suffered trauma, he added. Dr Tolmas said the joy of family helps get people through the rough times. For instance, Dr. Tolmas said, his and his wife’s oldest granddaughter graduated from NYU in May and just enrolled in the Israel Defense Forces. Their younger granddaughter attends the University of Michigan and likes to sing, he said. The Tolmases still have a warm spot for New Orleans. But they will stay in Dallas because of the friends they have made and because this is where their children and grandchildren now live. Diane Goldstein Freed has a different kind of Katrina story — one that is quite a bit more upbeat than others. Around the time of Katrina, Freed had flown to visit her daughter when the storm hit. There at the condos, she made a lot of friends. Born in Delaware, she lived in New Orleans nearly 28 years. Her first husband had cystic fibrosis and passed away Feb. 18, 2004. Being in the D-FW area really moved her life forward, she said. “Katrina was the best thing that ever happened to me,” she said. When she first got the chance, Freed returned to New Orleans every three months. That has since tapered off. Once she found her New Orleans home had not been destroyed and had only sustained wind damage, she had it fixed up and sold it in June 2006. Then there was the strange story of her vehicle. While her own personal luck was better than many, Freed still witnessed and learned about the horrible fates of others affected by the storm. “One of the tragedies of Katrina is how it broke apart families — it really scattered them,” she said. Kindness sparkles, and in the sparkles of Sarina Schick’s newest collection for Designs by Sarina, there is kindness at every shimmer. The Florence Collection, named for Schick’s mother Florence, of blessed memory, is a deep red garnet stone set in necklaces, bracelets, rings and earrings, rich with color, design, respect for its namesake, and honor to its beneficiaries. Schick donates 10 percent of all sales from the Florence Collection to the Be The Difference Foundation (BTDF) in honor of her mother’s valiant two-year battle against breast cancer and her 17-year fight against ovarian cancer that ended with her passing in 2012. BTDF’s mission is to help women increase their chance of survival of ovarian cancer. To achieve this goal, efforts are focused on raising awareness and money to fund programs for women fighting ovarian cancer today and to provide research dollars for a cure. “My sharing with Be The Difference Foundation is personal as I’ve seen firsthand what this terrible disease does. This organization is phenomenal and I couldn’t be more proud or honored to help in every way possible,” said Schick, who for a number of years has directed the vendor participation at the annual BTDF Wheel to Survive Race. “It is a privilege to carry my mother’s legacy by making a donation in her memory, knowing that the research that Be The Difference supports might someday help other women like her, before it’s too late. “My mom always wore red and she’d love the Florence Collection, and she’d love more that it is helping others,” said Schick, who creates from many crystals and semi-precious stones including labradorite, moonstone, mystic green onyx, set in vermeil, sterling silver, and gold-plate. Her works begin at $25 and are available at all price points. Schick, who is associated with both Congregation Ohr HaTorah and Shaare Tefilla, is the daughter of the late Florence and Lucien Henochowicz, sister of Michael and Warren, wife of Harry, mother of Aidan and Daniel, stepmother of Yardana, and proud grandmother of Tehilla and Yehuda. She moved to Dallas from Johannesburg, South Africa when she was just 15 years old. After graduating from Berkner High School, Schick moved to Los Angeles to work in her family’s computer store for five years, returning to Dallas in 1993. In 1995, Schick began a decade-long career working at Neiman Marcus, where she managed the Michael Dawkins line. Long a self-entertaining artist, sketching out her creative mind in pencil and charcoals, Schick eventually joined forces with Ronit Gordon in Saphira Jewelry. When Gordon moved to Florida, Schick forged ahead with Designs by Sarina, selling primarily her own designs, with additional works by other artists. As the fall season approaches, with many gift-giving and celebrating-in-style opportunities close by, Schick’s schedule is filling with fairs and festivals to share her wares. On Oct. 7, from 11 a.m. to 4 p.m. at her studio, she will host an open house, with Stacey Gaswirth and GeodesbyStacey, to donate 10 percent of all of their collection, the Florence Collection included, to the Be The Difference Foundation. Gaswirth is donating in honor of her friend, Kimberley Pitluk, an ovarian cancer survivor. At events at Temple Emanu-El (Nov. 15), Levine Academy (Nov. 19 and 20), Southwest Airlines Holiday Bazaar (Nov. 23 from 8 a.m. to 2 p.m.), and at the Be The Difference Foundation Wheel to Survive Race (Feb. 28, 2016 at the JCC), the Florence Collection will provide proceeds to research toward a cure and awareness and education. “As an organization, we feel we’ve hit the mark when those who have been affected want to help,” said Julie Shrell, BTDF co-founder. For Brenda Wright, a recent trip to Designs by Sarina was a mission to build her own assemblage from the Florence Collection. Her daughter Dasha had met Schick at a 2014 holiday fair and purchased a piece. This summer, Wright, now a returning customer, purchased a necklace, the “Melanie” style. Glitter, glamour, and giving for an incredible cause — what more can one hope for, all wrapped up? We hope one day that ovarian cancer, and all cancers, will be as easily wrapped up as the ability Schick provides to share. Schick’s Designs by Sarina is located at 4100 Spring Valley Road, Suite 631, in North Dallas. In addition to the Oct. 7 open house, meetings at the showroom are available by appointment. For more information, or to make an appointment, call 214-493-1093. For information about Be the Difference Foundation, call 214-466-1561 or visit bethedifferencefoundation.org. I grew up with a cantor of the Rockoff type: a big voice under a big hat, charged with carrying the prayers of all his congregants straight up to Heaven. That was the cantorial style that Ashkenazi Jews from Europe brought with them to America. But oh! How times have changed! For me, the ultimate performance of that sacred task is embodied in The Savior of Barnow by Polish storyteller Karl Franzos. Here on Kol Nidre night, an ordinary cantor raises his very best voice to the skies, and with it saves the life of his congregation when it was threatened by German might. But what is probably your first thought on reading this would be wrong: Franzos died in 1904, long before the Holocaust; he was writing of a cruel overlord who terrorized Polish-Jewish peasantry at the end of the 19th century, typical treatment that sent so many Jews seeking new homes in America. For many years, I belonged to one of this country’s few true Holocaust survivor congregations, founded by a group of German refugees who recreated their own old minhag in this new, welcoming place. The young rabbi they engaged here eschewed some of the formal old ways, which made for an odd sight as services began, when walking down the center aisle together toward the bima were the modern American spiritual leader in a suit, tallit and kippah and the old-country cantor in regal kittel and sky-high hat. But here’s what has happened since that earlier era: The strong male voices have been replaced in large measure by those of the females who make up half or more of today’s cantorial students. When women began attending American schools of sacred music, they came primarily from backgrounds of operatic training; at the same time, the younger males studying with them were drawn largely from the ranks of guitar players with folksy voices. Those men were not like the cantors of old, and — most certainly — neither were their soprano counterparts. The ultimate game-changer turned out to be a young woman with a guitar, a pleasant voice, and an uncanny talent for turning ancient prayers into modern poetry and setting them to easy-to-follow tunes that everyone could sing. Debbie Friedman introduced to American Judaism an accessible approach to liturgical music: All the “Jews in the Pews” could now join in song rather than being “entertained” by high-hatted men with big voices. And so it is that Richard Cohn leaves Temple Emanu-El here in Dallas to lead the Reform movement’s Debbie Friedman School of Sacred Music, while newly minted women cantors — no longer operatic divas — are taking his local place. In our geographic area today there are both male and female cantors and male and female rabbis who lead their own congregations in song, while Itzahak Zhrebker of Shearith Israel continues to prove beyond doubt that Jewish Week’s proclamation of old chazzanut‘s death was highly exaggerated. I still wonder what happened to the director of the Jewish day camp where I had my first group leadership experience so long ago. He taught us how to lead singing as well as two sacred rules: Always individualize, and never lay a hand on any child. And he did. That was 1950; I now realize retrospectively that Bertram Allen was riding the new wave of our cantorial future! I am 93 years old, and since I was a teenager have never received a satisfactory answer to this question: If Rosh Hashanah is the day of judgment and Yom Kippur the day of atonement, why isn’t the order reversed? Why not first repent and absolve yourself of your sins, and then go to the day of judgment? I hope I can finally get an answer! I hope you will find this satisfactory for many years to come! Rosh Hashanah begins the period called the “Ten Days of Teshuvah” or repentance, in which there is a mitzvah of introspection and teshuvah. It ends with Yom Kippur, when we finalize our teshuvah for our wrongdoings. We must attain a deeper understanding of teshuvah to answer your question. The Talmud states the following: “The wicked, even while alive, are really dead; the righteous, even after they die, are considered alive.” This reflects a profound definition of “Life.” Life is not merely defined by one’s eating, breathing and being social and involved in commerce. Life is rather defined by one’s connection to “Elo-him Chayim,” God, who is the Source of true Life. To the extent one is connected to the Source of Life, he or she is spiritually “alive.” The converse is true as well. One can theoretically be very energetically involved in many aspects of the world and even be quite successful by society’s standards while at the same time be spiritually dead, having no connection to the Source of Life. How does one go about being connected? Mitzvos are a connection. The Torah says numerous times that through the fulfillment of mitzvos we are “cleaving to God and therefore alive.” Sins, on the other hand, cause disconnect. The word “cheit,” usually translated as sin, literally means to “miss the mark,” or disconnect. Each wrongdoing causes another short-circuit in the grid of our connection to the Source of Life. With this we have a new insight to a seemingly strange statement by an early commentary. In our daily Amidah service the second blessing thanks God for the promise to, one day, return the Jewish dead back to eternal life, techias hameisim. This sage comments that between Rosh Hashanah and Yom Kippur, when one recites that blessing, he or she should have teshuvah in mind! What is the connection? The answer is that teshuvah, by repairing the circuitry, reconnects us to the Source of Life and brings us back to life! What gives us the strength to bring ourselves back to life? The answer is: Rosh Hashanah! That day coincides with the creation of the first man and woman. The Kabbalists explain that just as Adam and Eve were created on that day, so too our souls are renewed on Rosh Hashanah. On Rosh Hashanah our souls receive a complete recharging of our spiritual batteries, at the time of the shofar blast. This gives us the spiritual energy to begin the work of self-renewal within our own lives. We are empowered with the potential to bring ourselves “back to life” by reconnecting to the Source of Life. This is done through the process of teshuvah, culminating in Yom Kippur, which is the day we complete the process of renewal for the coming year. If Yom Kippur would come first, we would not have the spiritual strength to embark upon the process of teshuvah, which is the core mitzvah of that day. That is the beauty and the precision of the order of our High Holidays: First: Rosh Hashanah; second: Ten Days of Teshuvah; third: Yom Kippur. Wishing you and all the readers an easy fast and a sweet, meaningful and successful New Year with peace in Israel and throughout the world. What do you do with books you know you’ll no longer be reading? Sell them? Donate them to your local public library? Gift your favorite Jewish institution with any appropriate volumes? I admit to being “guilty” of all the above. But when I do the last of those three, the act sometimes becomes an exchange. Case in point: on a recent visit to The Legacy at Preston Hollow, I came away with a 40-year-old treasure which spoke to me in language appropriate to our rapidly approaching High Holy Days. This large-format paperback is Bechol Levavcha — With All Your Heart, written by Harvey J. Fields and published in 1976 by the Union of American Hebrew Congregations (now the Union of Reform Judaism). In it, Rabbi Fields provides trenchant commentaries on all the traditional Shabbat morning prayers, designed to promote understanding of the words in order to enhance their meaning as individuals say them during worship services. I found myself turning page after page and finding gem after gem. I had never seen this volume before, but during its time — which was when the now-itself-obsolete Gates of Prayer appeared as the new replacement for the venerable old Union Prayer Book — this must have been a most valuable tool for teaching upper-level high school and adult education classes. Let me share with you my most important discovery as I read through everything packed into these scant 178 pages (which include illustrations, transliterations, glossary and bibliography as well as text! ): It’s a remarkable story of the Aleynu, which ends virtually every Jewish worship service as we bow our heads and bend our knees in reverence to the One God. But Rabbi Fields intrigues us: “Seldom do we come across a prayer which is ancient, has brought persecution and death upon those who used it, and has become a symbol of a people’s courage and bravery. The Aleynu is one of those rare pieces…” So how did all this happen? Meant to be a hopeful prayer, it began — then, as now — with “It is our duty to praise the Lord of all, the Creator of the universe.” But then, it continued with “He has not made us like the nations of other lands … for they bow down to vanity and emptiness, and pray to a god that cannot save.” These words were derived from the writings of Isaiah, which of course were differently interpreted after the coming of Christianity. And it was some Jews themselves — the earliest to embrace Jesus as messiah — who accused the words of slandering the beliefs of their new religion. The fact that Isaiah predated Jesus by more than seven centuries made no difference. So the Aleynu caused Jewish grief then, and in the Crusades, and in the Inquisition, until finally, at the start of the 18th century, “the Prussian government censored the Jewish prayer book,” Rabbi Fields tells us. And since that time, those “offensive” words have never been returned to our worship! Rabbi Fields encourages his readers/students to compare the words of Isaiah, a fearlessly outspoken opponent of idol worship, with those deleted from the Aleynu, and asks if we might, or should, consider putting the latter back into a new prayerbook today. But his “today” was 1976. Two Reform movement prayer books have been issued since he wrote Bechol Levavcha, and those original words are still absent. All of us will bow our heads and bend our knees many times during the High Holy Days. As we do so, we might want to consider his question for ourselves. RICHARDSON — Beri Kaplan Schwitzer, Congregation Beth Torah’s new director of Congregational Learning, recently spoke about how her Conservative synagogue is one of only 16 across the country to join a new initiative to make Jewish communities more inclusive and welcoming to people with special needs. Schwitzer is talking about the USCJ Ruderman Inclusion Action Community, which involves a partnership between the United Synagogue of Conservative Judaism, the movement’s umbrella organization, and the Ruderman Family Foundation. In response to being selected, Beth Torah has put together a special group for strategic planning and special needs instruction. “We will find ways to provide physical, emotional and intellectual support for those with special needs from all areas,” Schwitzer said. Beth Torah is the only Texas synagogue to be appointed to the committee on the published list. Other members include Peninsula Sinai Congregation of Foster City, California; Congregation Bonai Shalom of Boulder, Colorado; Emanuel Synagogue of West Hartford, Connecticut; and Adas Israel Congregation of Washington, D.C., among others. The appointment was made a few months back, but the comprehensive list of 16 Conservative congregations seems to have only recently appeared online at www.uscj.org. Rabbi Steven Wernick, CEO of United Synagogue, said in an issued statement also on this site that inclusiveness is definitely important. “Thanks to the support of the Ruderman Family Foundation, we’ll provide the expertise and consulting that will let congregations enact the vision of one of Judaism’s essential teachings, that each one of us is created in the image of God and each life has intrinsic value,” Rabbi Wernick said. Jay Ruderman, president of the Ruderman Family Foundation — also in an issued statement — agreed. “Working toward the goal of building an inclusive community, our foundation is proud to partner with United Synagogue to help encourage the establishment of inclusive synagogues across North America and thereby making our Jewish community more welcoming for all,” he stated. “We want our students to feel comfortable,” she said.